Of Interest: As the MESSENGER spacecraft approached Mercury, the UVVS field of view was scanned across the planet's exospheric “tail,” which is produced by the solar wind pushing Mercury's exosphere (the planet's extremely thin atmosphere) outward. This figure, recently published in Science magazine, shows a map of the distribution of sodium atoms as they stream away from the planet; red and yellow colors represent a higher abundance of sodium than darker shades of blue and purple, as shown in the colored scale bar, which gives the brightness intensity in units of kiloRayleighs. The escaping atoms eventually form a comet-like tail that extends in the direction opposite that of the Sun for many planetary radii. The small squares outlined in black correspond to individual measurements that were used to create the full map. 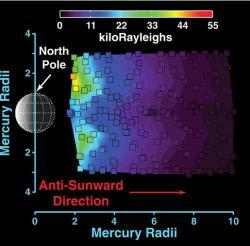 These measurements are the highest-spatial-resolution observations ever made of Mercury's tail. In less than six weeks, on October 6, 2008, similar measurements will be made during MESSENGER's second flyby of Mercury. 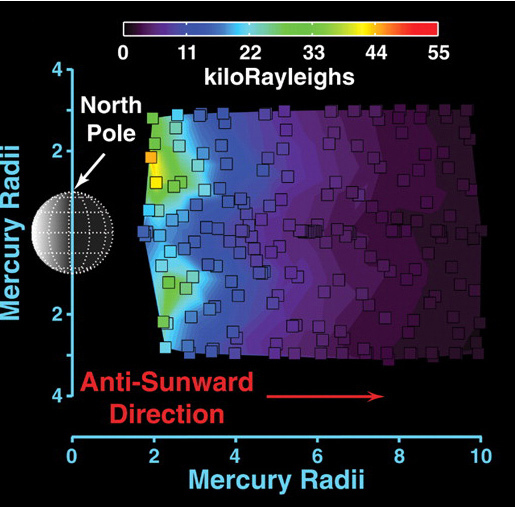 Comparing the measurements from the two flybys will provide an unprecedented look at how Mercury's dynamic exosphere and tail vary with time. Credit: Figure 1 from McClintock et al., Science, 321, 92-94, 2008.